Through my journey in life I have come to learn that this moment is all that there truly is, all else past and future, exists within my mind and is simply a reflection of my current internal state. While the equation above serves well on the individual level and in determining our personal experience, quantum theory suggests that the world in which we live is one created by the collective Mind or our collective consciousness. What this means is each of us play a role in the creation of the current "reality" we experience collectively. To understand this better consider how in most movies the lead role is the focal point of the story and although there are a wide range of other roles played within the movie, and they do influence the main character to an extent, ultimately it is his/her choices that determine the outcome of the movie. The efficiency of these choices is measured by the level of awareness/consciousness from which they are made. Conscious and aware choices GIVE US the power of change through our own willpower. Unconscious choices on the other hand, entertain the ILLUSION of chance and chaos leaving us feeling helpless and victimized by our external environment/input of those around us (collective Mind). This can be viewed primarily as individual consciousness because so long as we are aware and conscious of the power of our choices, the outcome of our "movie" will be determined by our own input. Collective consciousness has the same concept but with different roles. One of the easiest ways to understand the collective dynamic is to look at our immediate families. Within the family each person plays a role, some more influential than others but nonetheless each influences the collective unit and function of the family. Because each individuals choices effect one anothers lives, they are DEEPLY connected and this can be viewed as an example of collective consciousness in which the "reality" experienced within the family is based on the input of EACH member. As the stage grows (extended family and friends, county, city, state, etc) our individual consciousness plays a smaller and smaller role, but nonetheless it still plays a role, and just as our choices and actions determine the collective consciousness of our family, so too they determine that of the "reality" we experience in the world collectively because again, we are all deeply connected. So the roles simply change as the stage grows, however, it is only ourselves who CHOOSE to SETTLE for our current role in the script of life. it is choice that gives us the power to determine our future and therefore it gives us the power to determine our role allowing us to contribute more effectively into the collective Mind if we so choose to. What this means, as explained above with the family dynamic, is depending on the importance of our role or level of our input on society we effect the collective consciousness of It. So naturally because the president plays a greater role than myself, his input and choices have a far greater impact on the collective Whole than my own, which is to say his individual choices shape and determine the collective consciousness a great deal because he has a greater role in the script. This understanding leads me to the BIGGER message which I wish to convey through this writing. Often times people will avoid the Truth because it is perceived by some as "negative" justifying their reasoning through "the law of attraction" claiming that people focusing on "fear" and discussing some of the harsher "realities" in our world will only strengthen them. Well this does hold true to a certain extent, especially on the individual level, it does not as much on the collective scale, for the simple fact that those who are playing the leading roles in our "reality", who have a greater impact on the collective Mind are consciously working (contributing) AGAINST us and not for us. What this means is we can ignore the Truth and remain willfully ignorant/unaware and through this silence they will continue to literally steal OUR money, they will continue to go to war for profit, killing INNOCENT people on their path, they will continue to take over the food supply with GMOs, they will continue to violate our human rights, and in short they will continue. I do understand that "the system" by DESIGN is one that is based on debt and as Emerson said, "a man in debt is a slave" and this concept can be adapted to nations and countries alike, because the international banksters have cleverly set it up in this way. So I understand by design the system is deeply flawed in our regard, that the majority work 40 hours a week at jobs they dislike or at the very least are not passionate about, constantly paying on debt, upholding their false form of identity known as "credit", continuously living in a state of anxiety so that when we do have free time we want to be left alone and watch TV peacefully, which ironically makes us feel insecure and lost (also by design) which then results in a lost and insecure population which only breeds a world of ignorance and confusion. There is of course the escape of the weekend which many people live for trying to transform their "reality" for a night. This is the classic psychology of avoidance and understandably so because "the system" leaves us emotionally drained thinking, "I don't want to hear about how screwed up the world is because I already know!" Although as I said this indeed is understandable, this my friends, is denial. The Truth is just like ANY problem in our personal lives, not dealing with it is not going to make it disappear. It is only going to strengthen until we toughen up and face OUR problem. Our reasoning of the law of attraction is a reflection of just how unaware we collectively have become. It is in fact this unawareness that has allowed the ruling class to control us and create our current "reality", because while we CHOOSE to be unconscious they choose to be conscious, which as stated earlier results, either way, in creation. It is hard for most of us to accept the Truth that we as a collective unit are EXTREMELY ignorant and unaware. Because we have been indoctrinated psychologically, that to not know something is a sign of weakness or disgrace, so we act like we know everything when we know nothing. But "to thine own self be true" and lets put the BS aside for a moment. We are ALL ignorant in one way or another and this is NORMAL, it is OK. But what's NOT okay is to remain willfully ignorant, to remain willfully complacent and to remain willfully silent in a world in desperate need of a Voice. So what can I do then is the question. And the answer is simple. Educate yourself through ALTERNATE media (I have listed some sources below), read books, and in short SEEK knowledge. If you expect a ruling class to provide you with real education and knowledge you are sadly mistaken my friend. In time, when we become a SOURCE of knowledge we become more conscious and aware which then allows us more input into the collective Mind resulting in our transformation of being asleep and unaware to that of a Light in the dark. How we share this Light is simply a matter of choice. We can write blogs (like this), create videos, write books, start a website, form a local group, start a Facebook page, paint, etc. Now because the collective Mind is one that functions in terms of possibilities, the more avenues we explore, the greater the possibility of our input being received. As stated before, because we are all deeply connected, as we open our minds and soak up more and MORE knowledge, and in turn pass it on to others, we will create a domino effect that will ECHO in eternity! It is wise to remember that we will ALWAYS learn until we pass from this life to the next and therefore should assume the role of both teacher and student. Remember well that because our hearts are the roots of our lives, naturally, like a plants roots we must water it and focus on it instead of being eluded by the more physically visible leafs or branches that grow from the care we provide the roots. Although this is common sense it has been proven by science that when we are at peace within we literally CREATE a peaceful environment. Therefore the most important principle is to be at peace within. In summary, we all play a role in this world that effects the ENTIRE dynamic and collective consciousness of the people. This role is determined by conscious, AWARE choices, so by choosing to remain silent or avoid the Truth, it only results in an unconscious contribution. Meaning that we surrender our input which only strengthens the contribution of those whose intentions and actions conflict with our own (No opposition). The heart and mind are the roots from which all else grows, so maintaining inner peace is the FIRST principle from which to live by. There will, however, be times in which the Truth has the potential to evoke fear. In such an instance we should do our BEST to comfort our fellow brothers and sisters, reminding them (and ourselves) that they have CONTROL over their individual consciousness and internal being, no one else. But to deny or avoid that which can alter the collective "reality" will NOT prevent it from taking place (unless done, theoretically, by a HUGE part of the collective Mind) therefore it is FAR more shameful if avoided than voicing it could ever be. 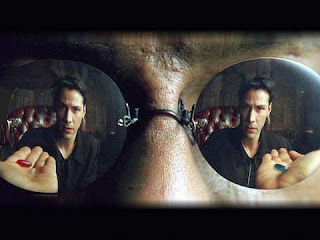 It has been said that we should choose Love over fear, which is a principle that I personally live by, however, this should NEVER be used as a justification to take the blue pill instead of the red pill, or choose ignorance over knowledge because it is ignorance of many that has resulted in the "reality" chosen by few. Therefore as stated, inner peace is the first principle to live by but knowledge and awareness MUST follow close by because these things combined equate to PURE freedom which is the cause for which we strive and that which the soul longs for. "He who passively accepts evil is as much involved in it as he who helps to perpetrate it. He who accepts evil without protesting against it is really cooperating with it." - Martin Luther King Jr.
*We should always question and research for ourselves though my friends, these are just credible sources in MY opinion.